sign-up for the 2019 season! how does harvest pick-up work? Can I really take whatever I want? This tote bag limits your total volume of pre-harvested produce that you can take from the harvest bins each week. All u-pick crops, berries, flower bouquets, herbs, and some bulk crops like preserve cabbages and cucumbers and large melons and squashes are icing on the cake and do not need to fit in your bag. We post weekly limits on certain crops when they are scarce (for example, “1 bunch Bok Choi per share” or “1 pint strawberries per share”) but other than that, harvest is free-choice. Don’t care for beets? Don’t take any. Want to make a huge salad for dinner? Take 4 heads of lettuce! When and where IS HARVEST PICK-UP? Saturdays from 8am - 1pm and Tuesdays from 1pm - 6pm. All produce is picked up at our barn at 13024E Green Valley Rd. in Sebastopol. The fields and garden are a short walk from the barn. The fields and garden are open 7 days a week for u-pick and enjoyment. For more thorough directions, please see our Contact page. When does harvest pick-up start...And when does it end? Each year’s exact start date depends on the rains that year but will usually fall sometime mid May and mid-June. Harvest pick-up runs for 26 weeks from the start date. In 2017, one of the wettest years on record, we started harvest pick-up on June 17th and ran until December 12th. WHAT KIND OF SHARE SHOULD I SIGN UP FOR? Membership dues are based on how many adults are going to be eating from your harvest pick-up each week. Do you live with someone and share meals with them? You would be a Two Adult share. Do you want to share your harvest tote with a friend that you don’t live with each week? You would also be a Two Adult share. Each adult regularly consuming food from your harvest share should be counted as a member regardless of their degree of participation on the farm or degree of vegetable consumption. Kids ride free. Can I come on either harvest pick-up day? Members can come on either Saturday pick-up or Tuesday pick-up, whichever you choose, you don't have to tell us which day you're coming, and it can change each week. Members may only fill their bag once per week. For example, if the season starts on a Saturday, "Week 1" would encompass a Saturday pick-up and the following Tuesday pick-up. You could come get your produce on either day, we just ask that you do not fill your bag on both Saturday and Tuesday of the same week. Members are welcome to come to the farm for u-picking, flowers, herbs and enjoyment sunrise to sunset, 7 days a week. can you explain the logic behind your pricing structure? Our model is unique in that what you are paying for is a relationship to the farm —a free-choice share of the farm's harvest, access to u-pick crops and the garden, invites to events, and access — rather than a set quantity of produce each week. This allows for a great deal of flexibility in what each household takes home each week. The main questions that informs our pricing is, "How much does the farm need from each adult member to grow bountiful food for them while taking care of our soil, ecosystem, and farmers?" I’d like to buy a share, but the price is outside of my budget. Do you offer share price assistance? Yes. Please request share price assistance in the sign-up form. We cannot guarantee share price assistance funds will be available. Share price assistance is funded by other members who've donated to our Share Price Assistance Fund. Can I give out produce to friends and relatives? Potlucks? Yes! Dinner parties? Definitely! Pickle gifts? Sure! Generally, your harvest share is meant to provide for the daily needs of you and your household. If you would like to share produce from the farm with a friend or relative regularly every week, we ask that you count them as adult members of your household when signing up. Does the share include fruit? The 2019 share will include melons, strawberries, wild blackberries... and of course fruiting vegetables like squash, tomatoes, eggplant, peppers, etc. We don’t have any tree fruit at this time. 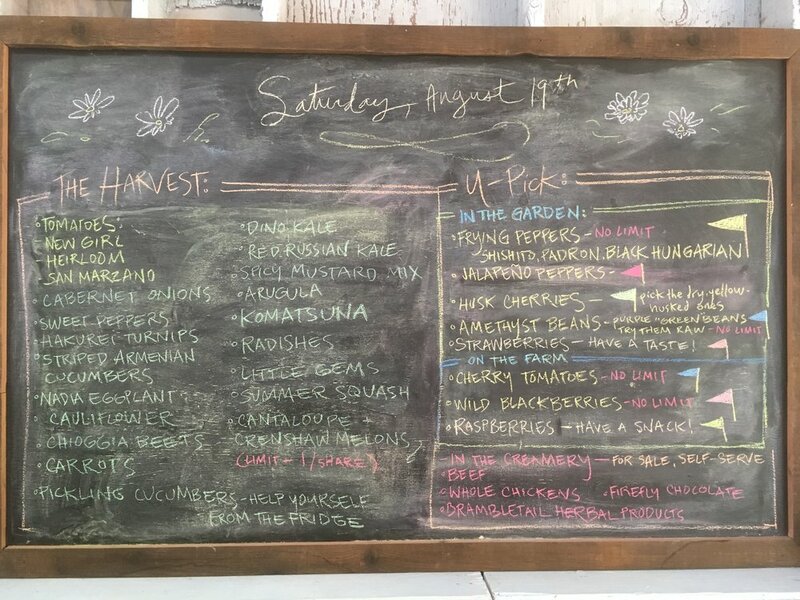 We note any limits and color code the weekly u-pick goodies on a board in the pick-up barn. If you are going to be away for part of the harvest season you're welcome to have friends or family pick up your share instead. Vacations are a great opportunity to give the gift of the CSA experience to someone you love. Can I join the CSA on a monthly or weekly basis? No, membership is for the full 26 week harvest season. can I come visit the farm before signing up? Yes! We'd be happy to show you around the farm! Please contact us. Can I join late into a season? Yes, if there is space open once a harvest season is underway we can pro-rate the cost. What if I want end my membership? Are there refunds? Only for unforeseen circumstances. Please only sign up for a CSA membership with assurance that you'll be able to enjoy it. If you need to cease membership mid-season due to unforeseen circumstances, we ask that you please find someone to take over your share. The reason for this is that your membership dues are used early in the season to pay for the farm’s upfront costs like seeds, compost, and equipment that are needed to establish the fields and garden for your harvest share. CAN I SHARE A SHARE? You may share a share if you are going to be alternating weeks (for example, two couples or two individuals alternating weeks). Groups sharing a share have a few additional responsibilities: We ask that people sharing a share choose a point person to coordinate payment with us and scheduling within your group; if you are sharing a share, it is your responsibility to monitor your harvest take so that you are not “stocking up” on two weeks of produce for your off week. This would be unfair to other members and to the farm. Please let us know if, and with whom, you will be sharing a share when signing up. Groups sharing a share will be charged $12 for an extra tote bag so that each household has one.